You can use raw or cooked chicken carcasses. I usually roast two birds then make stock the next day and this will give me 3-4 portions of stock. The vegetables give the stock more flavour but if you don't have them its fine to make a stock with just seasoning. 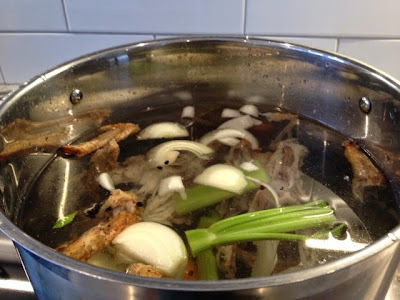 The longer it simmers the more the bones break down releasing good stuff into the stock. Bring to the boil then simmer on a low heat for at least 3 hours.